The Texas Rangers have dealt with a solid starting rotation throughout the season, wherein the Rangers boast the fourth-best team ERA (3.70) in the American League (although much of that is due to the masterful bullpen pitching from the likes of Joe Nathan, Tanner Scheppers, and Robbie Ross). 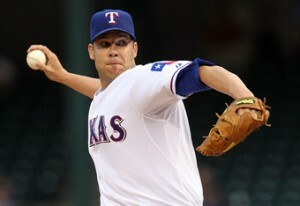 Despite a solid rotation, the fact that Alexi Ogando is currently on his second stint on the DL in the past month and workhorse Colby Lewis has yet to make his season debut are more than certainly preventing the Rangers from reaching full potential as division stalwarts in the AL West. On Friday afternoon, Lewis threw off of the mound for the first time since being shut down with elbow soreness, but will need to complete plenty of mound sessions before facing hitters. At the moment, Lewis’s timetable for a return is slated at no sooner than late-June, but is still highly provisional in nature. A similar questionable timetable surrounds Ogando as well, who after spending over two weeks on the DL with bicep tendinitis has returned to the DL with soreness in his right shoulder. 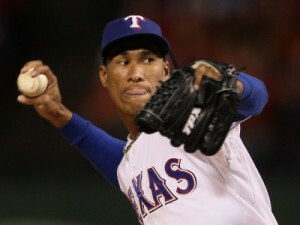 Although he has continued to throw off of flat ground, Ogando is still experiencing soreness in his shoulder, prompting the Rangers to limit him to non-mound activities until the pain subsides. Once he is pain free, Ogando will be expected to resume throwing from the mound and complete a couple of rehab assignments before rejoining the Texas rotation. As is the case with Lewis, a return for Ogando is still unknown, but it can be assumed that he will not be returning to the rotation anytime soon as he continues to cite soreness in his shoulder after nearly a week of being on the DL. For now, the Rangers must continue on in their search to regain their dominant, early-season form, as they are currently mired in a six game losing streak, having dropped eight of their last ten games. Boasting a 38-31 record, Texas currently sits second behind the Oakland Athletics in the AL West standings.